There's just something about flowers that makes us happy. 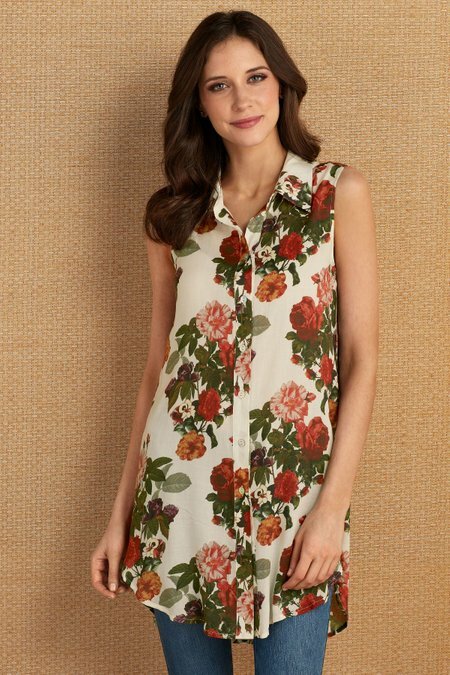 Brimming with good cheer and the warm colors of autumn blooms, this long-length tunic of rayon challis is the very definition of charm. Its sleeveless silhouette is perfect for late summer heat and pairs easily with fine sweaters when the fall chill arrives. A button-down front, shirt-style collar, and slight high-low hemline complete this lovely look. Rayon. Misses 34"/35" long.